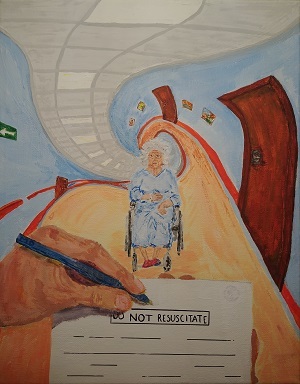 This acrylic on canvas painting represents a physician unilaterally completing a do-not-resuscitate order for an unrepresented patient. The art is by Munir H. Buhaya, a first-year medical student at McGovern Medical School in Houston. “Illuminating the Art of Medicine” is my favorite part of the AMA JOURNAL OF ETHICS.